How do I get something sticky like honey or Golden Syrup off measuring spoons or measuring cups? Is there a better way? When I put honey in a spoon or measuring cup, the residue stays and it’s hard to get all of it out. How do I make it all come out? Is there a way to measure honey without leaving honey on a spoon? As, since this answer other suggestions have abounded, let me clarify. These methods assume you want no wastage & also no cross-contamination of your source jar of the sticky component. They also require almost nothing in the way of 'extra equipment'. Depending on what the next steps to your recipe are, I can think of three alternatives. None are perfect and each would suit a different scenario. Tip it and leave it a long time. Heat it slightly. Microwave or sit the container in hot water. Rinse it out with the next liquid ingredient you will use in the same recipe; or for a spoon, stir your existing ingredients with it. 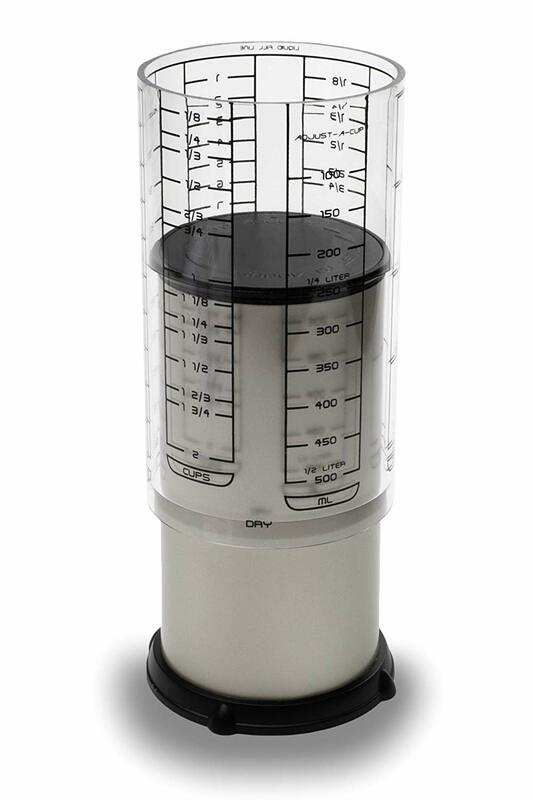 It's possible to get specialized equipment for this: a plunger measuring cup. The base is adjusted to the level you need to measure, the sticky honey or syrup is poured in, and then the cup is upended and as the base is pushed in, it scrapes the sides as it travels. I'd only invest in this if you very frequently measure sticky ingredients -- it's not strictly necessary, but it can be a timesaver for some recipes. It's available from many different brands. What I do, if the recipe calls for any sort of oil, measure that first, then the honey slides out pretty well. Your concern is NOT getting the measuring item clean. Your concern is ensuring the right amount of ingredient goes where it is desired. If you have decent accuracy digital kitchen scales (relatively cheap usually but may depend on your location), you can measure by weight. Place the measuring item (spoon, cup whatever) on the scales. Tare the scales to zero. Scoop quantity of sticky substance. Measure on scales, and note the number. Place destination bowl on scales and tare to zero. Add sticky substance up to the desired weight. It's not a perfect solution, but using two spoons and scraping one with the other you can get the majority of the syrup off the spoons relatively quickly. Silicone spatulas are quite good at cleaning hard vessels well. Combine that with a small enough measurement - so don't measure 50 ml of honey in a 1000 ml cup, use as close to 50 ml as this gives you a better ratio of volume-to-wall-surface - then scrape with the silicone spatula, and it will be almost as clean as licked. For getting the cup clean afterwards, wash with hot water, not merely warm. Heat the utensil. For a spoon, fill a coffee cup with boiling water, and drop the spoon in there for 30 secs or so, or for a measuring cup, just fill it with boiling water before measuring out the honey/syrup. The heat will reduce the viscosity making it pour off the spoon/out of the cup better. I've found that a light spray of cooking spray on the spoon or in a measuring cup will make measuring any sticky substance very easy. Rub a tiny amount of neutral oil onto the measuring cup prior to measuring. Why not put the honey pot on the balance instead and take your measures at reverse? That's what I do. Convert all measures to CC's and then use syringes. Different syringe for each ingredient. Minimizes waste, and they come sterile. Water on your spoon will help, I found that when I put peanut butter into my drink in the morning and used a wet spoon from the draining board that it is considerably less sticky. In the case of honey or syrup, buy a squeezy bottle, and measure out the amount by placing the receptical on a balance and squeezing until enough comes out. The bottle can be rinsed out and used again and again. I also buy glass jars of honey (much cheaper than squeezy), and decant that into the squeezy bottle. Line your measuring cup with a bit of Saran Wrap. It's thin enough that it won't mess up the volume/weight by any significant amount. When you're done measuring it you can just pull the Saran Wrap out of the measuring cup and scrape the honey that sticks off with a silicon spatula. Even better, when you're done you just throw the Saran Wrap away and your measuring cup never gets dirty! Not the answer you're looking for? Browse other questions tagged baking equipment measurements or ask your own question. Cup measurements: shake or scrape? What does “spooned and leveled” mean? Why are baking measurements such nice round numbers? What do you use to measure the weight of ingredient? Is baking by weight really more accurate? How do you recover if you lose track of what you're measuring? What general rules should I follow to ensure that my measurements are accurate? Is it ever more accurate to measure by volume rather than by weight? How should I pick a flour volume to weight conversion for an arbitrary recipe?